I know I've used this image in an Alva Day lecture, but I don't think it's been on the photoblog yet. In September 1949 this Mt. Hood Railroad train derailed taking a big chunk of the Powerdale pipeline with it. What a mess. I'm sure Arlen can tell us about the apparatus being used to clean up this accident. An expensive and time consuming derailment, repair the rails to get equipment in, arranging to get the UP "big hook " brought in from Albina or The Dalles, and getting the pipeline back in order. Poor Arlen. He will be sad to see a wrecked train. 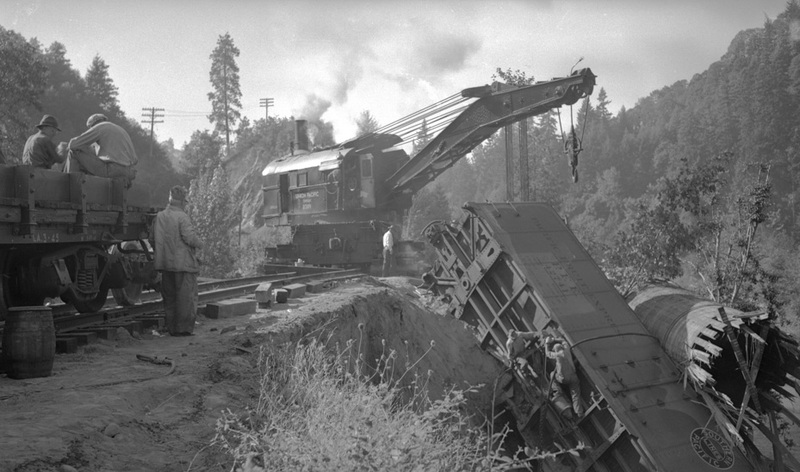 I am curious how it derailed. Must be a newspaper article somewhere, giving detailed information. A few days before this there was a major mudslide in Dee. I suspect there was a washout of the tracks. It's hard to tell the cause from the photos, but the pipe was ruptured, a major section of track was washed away, and the train derailed. I suspect something storm related caused the initial pipe rupture, leading to all the rest of this mess. WOW, those two guys on the derailed SP car working to attach the rigging have a tough job......bet that pipe line blow out was spectular....hopefully, the loco crew got out OK. One can watch a rail steam crane in operation at Antique Powerland Museum in Brooks during the annual steam up...last weekend in July, first weekend in August. Hoping Arlen can tell us where the UP steam crane or "big hook" was stationed and brought in from. I can only guess Albina or The Dalles. I would guess UP stationed hooks at both sites Kenn.